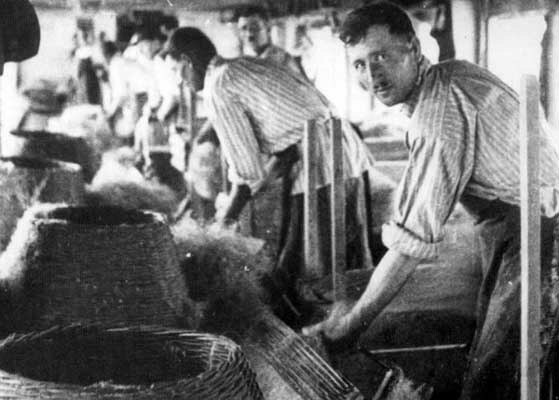 The superior quality of the hemp grown and processed in the Batschka, the economic upswing and Germany’s war preparation created an increase in the demand for hemp products. By the time the Batschka was returned to Hungary in 1941, hemp factories, hemp combing plants and hemp export firms in Batschka grew like mushrooms. 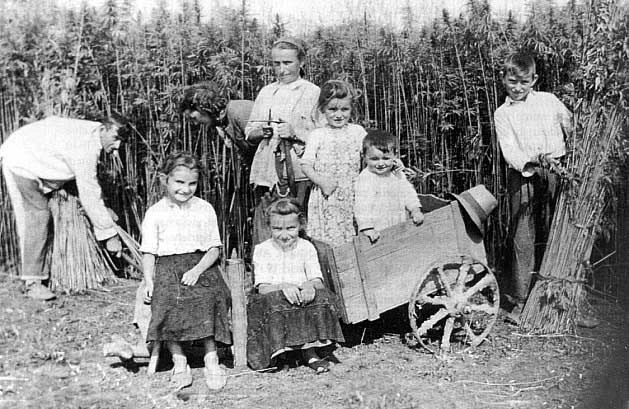 Hemp had been grown from the time of settlement, particularly in the German villages. At 10% of all agricultural production, the demand for hemp products was already high and would increase to 30% by 1944. Hemp was grown on the best fields containing rich humus soils. This was often achieved on freshly cut forest grounds where bumper crops could be harvested twice during the year. The fields had to be plowed three to four times a year, fertilized with plenty of dung and in the later years mineral fertilizer found its use. The planting was done around the 20th of April to the 10th of May. Growing hemp did not require much care since it grew very tall - about 2.5 meters high, giving weeds little chance to grow. On the average with good weather and the right amount of rain, the hemp could be harvested in 105 to 110 days. After the hemp harvest, wheat was often grown very successfully on the same fields. Harvesting took place only after the hemp blossomed, to obtain the best quality. It was also extremely important that proper cross-pollination took place, as poor cross-pollination would yield a lesser quality. 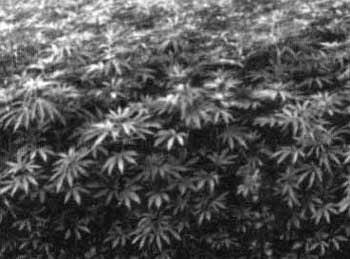 The hemp buyers did inspect the fields of a grower prior to giving the o.k. to harvest the hemp. 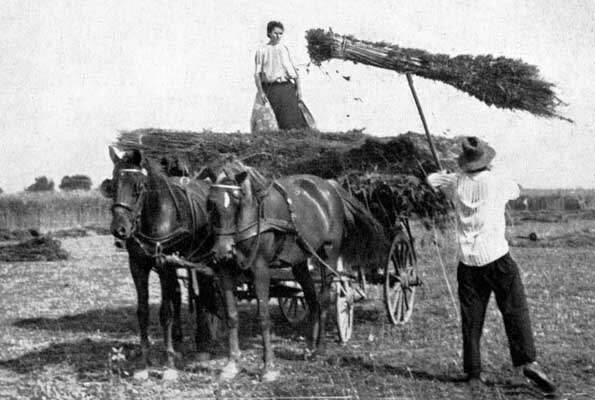 The hemp was usually sold directly to the hemp factory either according to weight or by acreage. 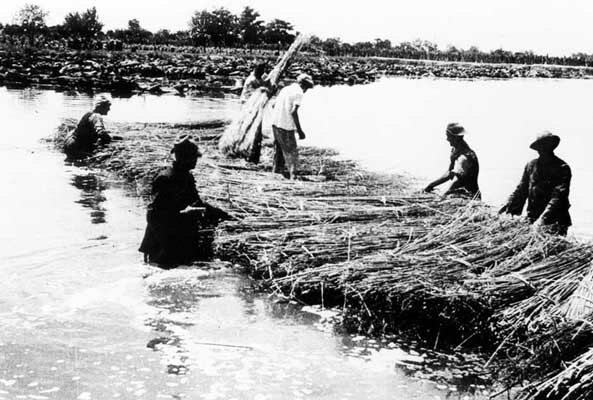 As soon as the hemp was cut and dried, it was taken to the curing area were it was submerged into water about 1 to 1.5 meters deep. 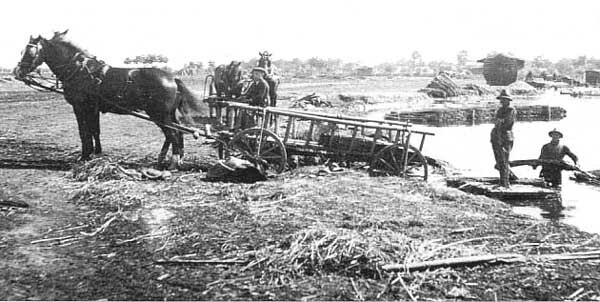 They used swampy rivers (in Batschsentiwan it was the Mostonga River) or dug out curing pits to accomplish the curing of the hemp. The hemp had to be submerged into the water using the rivers muck from the river bottom, which was placed on top of the hemp to submerge it. This was extreme difficult work. This was extremely difficult work, and as early as 1910, improvements were introduced to the curing process, such as the use of wooden boxes in the pits that were filled with water, making it easier to apply the necessary weight to submerge the hemp. Another disadvantage of open water curing was that the hemp had to be washed to clean it of the muck used to submerge the hemp. The curing process was achieved when one could see germination taking place as the hemp produced small bubbles. The process of curing took about 4 to 5 days and in cooler temperatures somewhat longer. 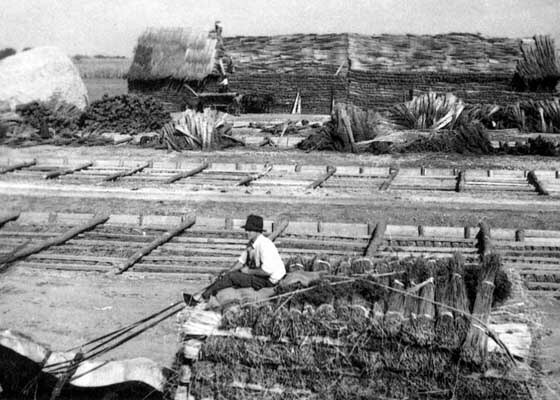 The hemp was removed and laid out to dry before the breaking process could take place. When more room for drying was available the hemp was laid flat, which made it lighter as the sun dried and naturally bleached the harvested hemp. 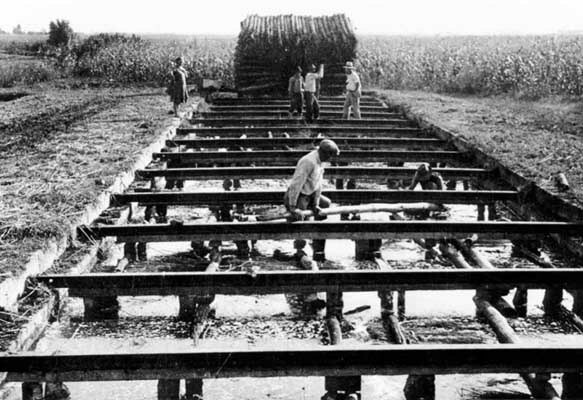 The hemp-breaking process was also very back breaking work and produced a by-product of “break-wood” (splinters) called “Brechagel” and the primary product of hemp string fibers. 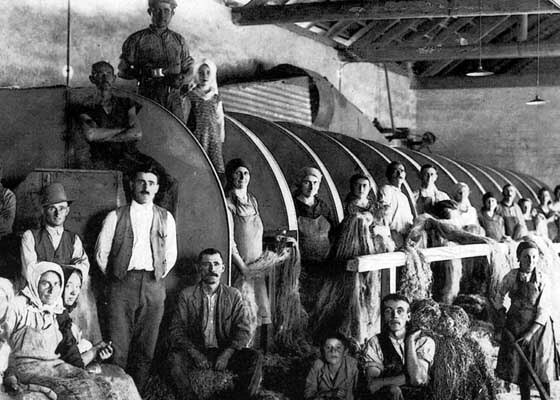 When separated, the fibers were taken to the combing factories from which several grades of “swing hemp” were produced. The combing process produced a by-product known as the “wick.” It was the actual knotted parts obtained through the process. The wick found many uses such as packing and insulating material. In earlier years, wick was used as binding material in construction of the “rammed earth” houses in place of straw was used and also found uses as ceiling rolls (see building our homes). 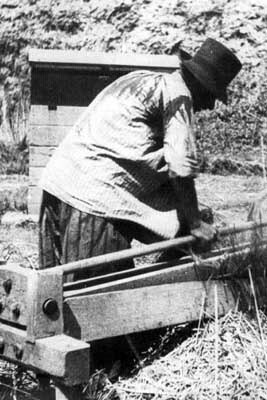 The “Brechagel,” or break-wood hemp became an inexpensive heating material for the winter for many of the families of low income. The measurements were derived from the Austrian-Hungarian system of measures. The weight was measured in Kilogram and Kilogram Meters. The area in Katastraljoch and Klafter which contained 8 Klafter by 200 Klafter giving you an area of 1,600 square Klafter equaling 5,754 square meters or an area of 75.8 X 75.8 meters. On a good field one could harvest 6,000 kg of hemp. At the time of our expulsion there were 9 factories in Batschsentiwan, one in Sonta, one in Svilojevo. Their names; 1. Augustin & Gams, 2. Jakob Himmelsbach, 3. Anton Kerschner, 4. Brothers Lenz & Seidel, 5. Stefan Martin, 6. Pfeiffer & Hack, 7. Johann Tettmann, 8. Anton Theiss, 9. Georg Wahl, 10. Johann Wurtz (in Svilojevo), 11. Carl Zirbs & Sohn (in Sonta) and Geza Gabor in Sonta a leased factory. 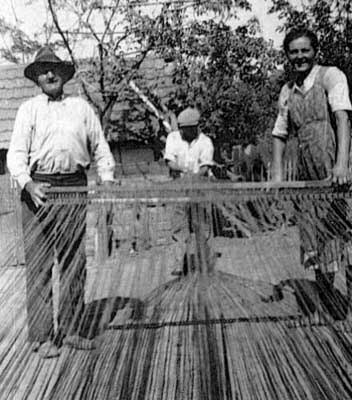 Batschsentiwan had two rope makers: Ebli und Miritsch. They produced cow and horse ropes, ropes for bridles, as well as, ropes for various applications of different length and thickness, ship-lines, small ropes, clothes lines and tow ropes. First-rate swing hemp could not have more than 2% waste. The half-rate swing hemp however, was allowed to have 8% of waste. The quality was numbered by grade, and the combing factories usually produced grades 4 through 8. A quality of 4 was used for sacks while a quality 5 was used to make tarps for wagons, trains and trucks. Qualities 5 through 7 found their use for clothing, bedding and the “ticking” for the “Strohsack” (the mattresses of the Donauschwaben, often stuffed with fine leaves obtained from husking corn, long underwear in Hungarian called ”Gatjer“), trousers and aprons for women and men. The finest quality of grade 8 was used for shirts and fine linen. It was obtained by rubbing the fibers by hand, but was not produced in quantities. In Batschsentiwan, it was only produced by the Thomas Raab factory. In more recent years, speaking of the 1930’s, most of the processing was accomplished with machines. 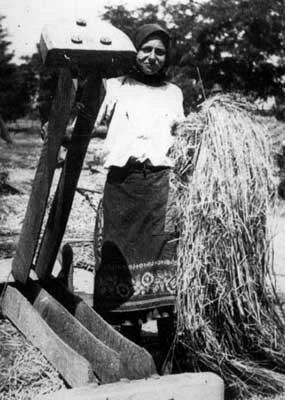 The finer grades of hemp were usually spun into yarn by the women during the winter months, which were then taken to the weavers. Batschsentiwan had three weaving factories: Kraml, Pechlov und Tschismar. At the time of the Danube Swabian expulsion, there were still 37 combing factories in operation, 11 large factories and 26 smaller. 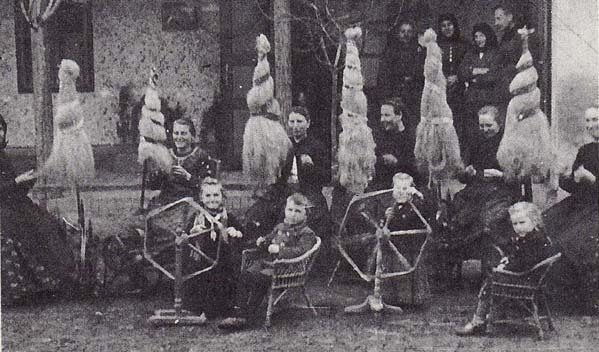 The owner of the combing factories were: 1 Augustin & Gams, 2 Georg Berg, 3 Leopold Berti, 4 Michael Bretträger, 5 Georg Daljac, 6 Drescher & Kowatsch, 7 Stefan Ebli, 8 Stefan Ebli (Frau Hippich), 9 Adam Fink, 10 Andreas Fink, 11 Jakob Fuderer, 12 Michael Gams, 13 Wilhelm Hemm, 14 Johann Herrmann, 15 Herrmann & Dombeck KG, 16. Jakob Himmelsbach, 17 Anton Kerschner, 18.Karl Kihn, 19 Johann Kleiner, 20 Kasper Knobl, 21. Josef Kurutz, 22. Franz Mahr, 23 Georg Marz, 24 Josef Marz, 25 Pfeiffer & Hack, 26 Valentin Pokasz, 27 Jakob Posch, 28 Thomas Raab, 29 Hans Sekulinac, 30 Johann Tettmann, 31 Anton Theiss senior, 32 Anton Theiss junior, 33 Johann Theiss, 34 Georg Traub, 35 Josef Traub, 36 Andreas Wiegert, 37 Carl Zirbs. The combing factories at the end of 1944 still occupied about 400 combers. 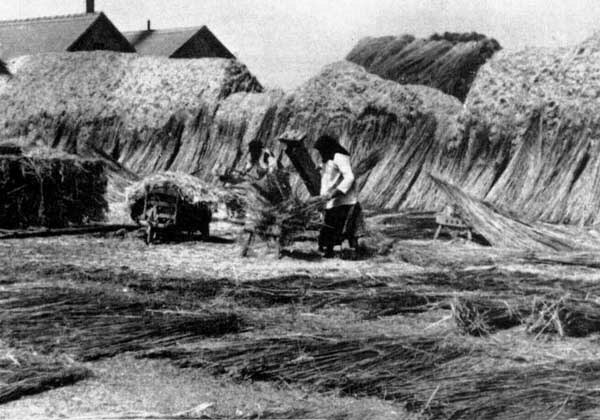 A comber could comb about 25 kg of hemp in an hour, which was about 20 kg in an 8-hour day. 400 combers produced 8,000 kg of combed hemp per day. By 1900 companies were already exporting their products to England. The export firms of Batschsentiwan after the First World War delivered not only to countries in Europe but also throughout the rest of the world. The main buyers were Germany, England, France, Switzerland and Czechoslovakia. Therefore it can easily be understood why the hemp was referred to as the “White Gold of the Batschka,” not only for the people of Batschsentiwan, but for all the Donauschwaben in the Batschka. It also can be easily understood how important the hemp production was for the Kingdom of Yugoslavia. The hemp production was backbreaking work, but it brought great profit. 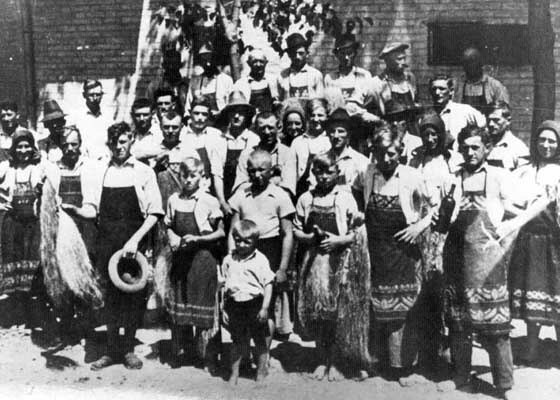 The hemp industry employed 40 % of the German workers and produced 76% of Yugoslavia’s export prior to WW II in which Batschsentiwan participated with 20%. Their hemp export sales before WW II were 120 to 150 million Reichsmark. On average, the Donauschwaben farmer used 20 to 25% of his fields to plant the “White Gold”, while Batschsentiwan used 30% of their fields. The factories produced 2,400 metric tons of raw hemp. 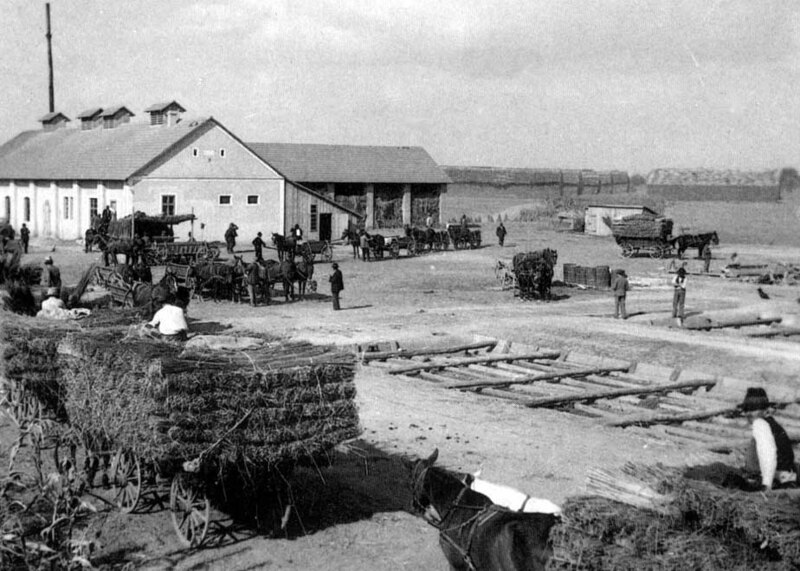 Up to 1944 the hemp trade centers in Europe were Hodschag and Neusatz (Novi Sad). 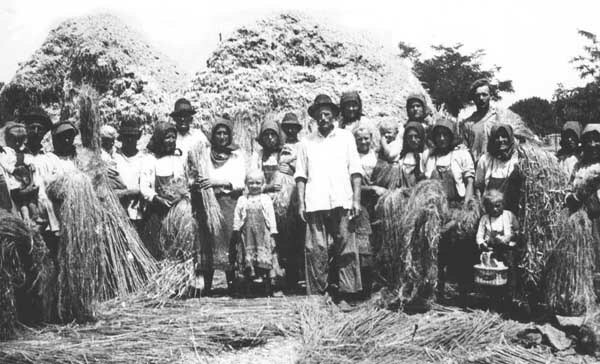 Of the existing 140 hemp factories in Yugoslavia in 1942 in the Batschka, 101 were owned and operated by Germans and they grew about 80% of the hemp and produced 95% of the hemp products in which Batschsentiwan had a leading role. 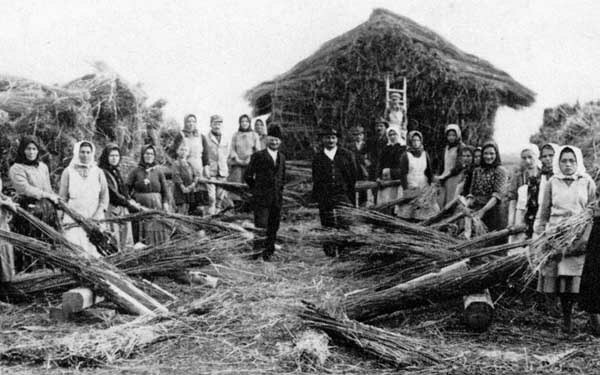 The Donauschwaben vaulted the Yugoslavian hemp export into the fifth largest market in world, only surpassed by Russia, Italy, Japan/Korea and Romania. 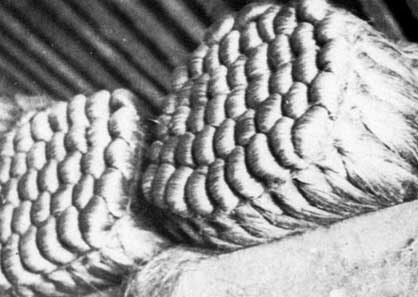 However, the hemp the Germans produced was superior in qualities of tensile strength, as well as water resistance. This makes a total of 13 towns with 215 companies and 1,878 combers. As can be seen, Batschsentiwan employed the most combers with 35.2%. The town of Batschsentiwan with a population 6,300 employed 1,300 people in their hemp industry in addition to the farmers growing the hemp. The town had 11 major exporters after the First World War. 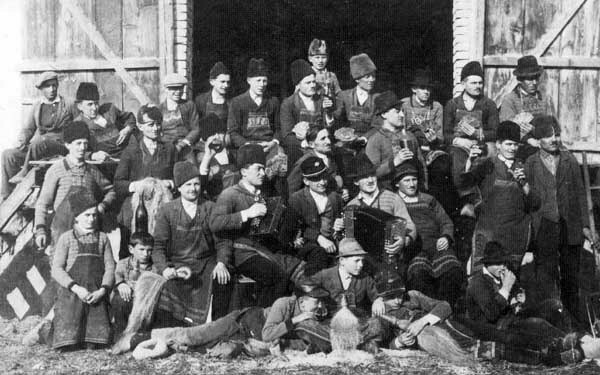 The exporters were: Augustin & Gams, Johann Hermann, Jakob Himmelsbach, Anton Kerschner, Hans Kleiner, Nikolaus Pfeiffer, Thomas Raab, Franz Tettmann, Johann Tettmann, Anton Theis und Karl Zirbs. From 1941 until our expulsion in 1944 the hemp export of Yugoslavia came to 90% from the Donauschwaben in which Batschsentiwan participated with 22.6%. In 1941 the town began to feel the impact of the war when the first hemp factory of the Theiss family was burned to the ground. Only a half hour later, it was the Augustin & Gams factory, which succumbed to the saboteurs. Since the Theiss factory stood near our home, I became a witness to the fire and watched it consume the entire plant in a few hours. However, only the factories supplying hemp to Germany were affected by the saboteurs; those delivering goods to England and France were spared. The Serbian police could not or would not seek out the people responsible for the fire, but in the end the owners actually profited, with the insurance compensating them and many built new companies in Austria or Germany. Yugoslavia became a big loser, as they lost the hemp production of the future, and with it substantial revenue they would never again realize after the war. 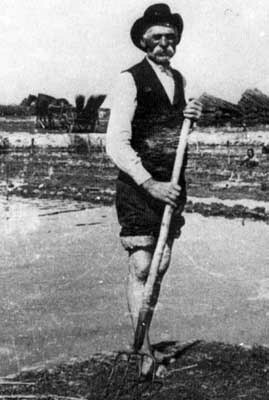 It was an economic downfall from which they never did recover after the Donauschwaben were expelled. This was certainly the biggest blunder by Tito’s regime. Hemp the white “Gold of the Batschka” was a product of hard labor and many sacrifices, as the photo sequence reveals. Excerpts from the book “The Last Generation Forgotten and Left to Die” by Hans Kopp, with additions. The stalk was cut off just above ground. underneath the muck of the river. The curing took 4-5 days (or longer in cold weather). process is completed was not an easy chore. 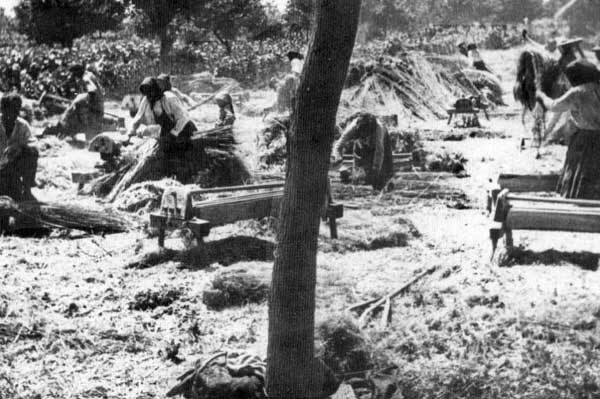 Hemp was laid out in the sun to dry. The hemp strings are further processed in this step, and separated into “spin hemp” which was soft and spun into clothing and fine linens and “swing hemp” which was used to make the rope. The by-product of “wick” was used for stuffing, or building materials. 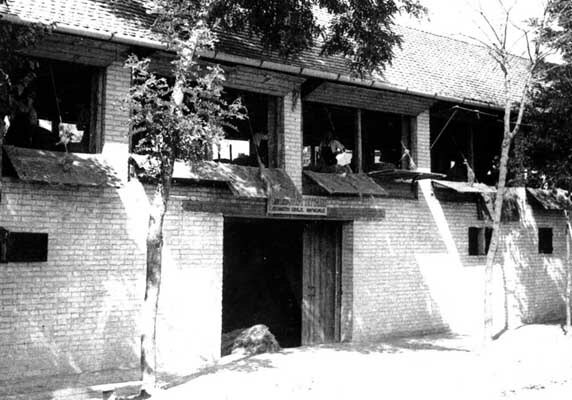 The Theiss family hemp factory in Batschsentiwan. Open stalls provide fresh air & daylight for the workers. It was this factory I saw going up in smoke during the war in 1941, started by saboteurs. The fire created a huge thick dark cloud one could see from afar. There were no firemen at the time to save the plant and when we returned the next day only ashes were left where many workers once earned a living. shows us his operation of making ropes. 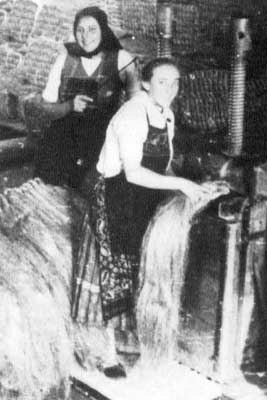 These ladies in Batsch-Brestowatz with their little helper spin hemp into yarn, while the children roll up the yarn coming of the spinning spindles.